Did you make any New Year’s resolutions? These are changes that are supposed to lead to a better, happier life but often people tend to make resolutions that are too much to manage which can lead to disappointment. So this year, let’s simply resolve to have fun. For a little inspiration, meet Baddie Winkle: She came to social media stardom in 2014 after a series of hilarious snaps and selfies were posted online. Who wouldn’t be impressed by an 86-year-old taking part in the ice-bucket challenge and dancing to the latest hip-hop hits? She even lives on her own and seems to have a penchant for tie-dye shirts. What started as some fun with her great-granddaughter has turned her into an older adult icon of sorts – even millennials wish they were as cool as her. To date, she has over 550,000 followers on Instagram and 246,000 followers on Twitter. Now, nobody is saying you need to twerk, dress up in urban streetwear or take a dive on a slip-and-slide but the message here is at any age, it’s important to have fun. Try something new. 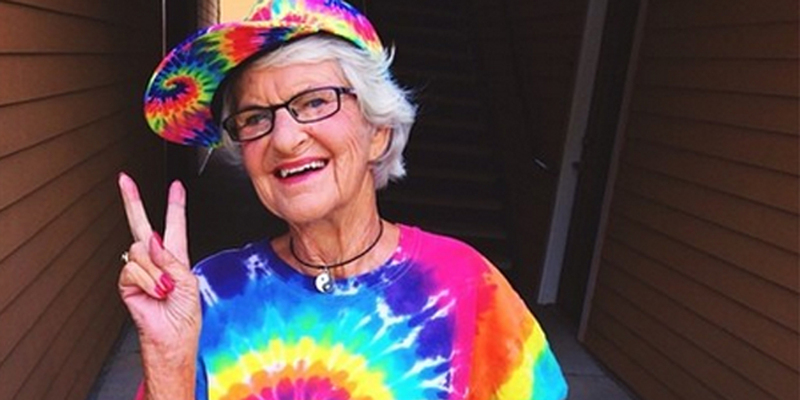 “I started doing things I hadn’t done before,” Baddie Winkle told us. She lost her husband and 30 years ago and 15 years later, she lost her son. She didn’t like being in mourning all the time and said, “I decided I could not go on living in the past.” Your situation might be different but why not take up a new or forgotten hobby? Even if you don’t like the activity at first, give it some time before you move on to a new hobby. Focus on doing things that will make you smile and laugh. Get active. Stay active. Tai-chi, yoga, stationery cycling are all simple and safe ways to get your heart rate going. Don’t forget that exercise leads to the release of endorphins which is bound to put you in a better mood. Baddie Winkle is a big fan of water aerobics and goes three times a week. Use social media. “It’s interesting and it’s fun,” said Baddie Winkle, who has slammed the followers that claim she doesn’t do her own tweeting. She said it’s not necessarily easy to learn how to use social media but if a grandchild can teach you how to use it, it can be an entertaining pastime. Through social media, Baddie Winkle has had the chance to meet people from around the globe and while you may not have the same experience it’s a great way to connect with friends and family, stay informed about the latest news, and even enjoy the occasional funny video.